The role of the food supply chain in the health and well-being of remote indigenous communities is often overlooked. Ian Lovell describes this situation in terms of supply chain performance and what needs to be done to improve it. No health and well-being issue in Australia … is worse or more urgent than the appalling health … of indigenous people. The challenge … is to improve access to good food and nutrition … and for those … in remote areas this poses particular … transport, economic and management issues. In remote indigenous communities there is a clear link between life expectancy, chronic disease, nutrition, food quality, affordability and cost (see Health Facts and Food Cost Comparisons boxes). To address the shortened life cycle of indigenous people we need to combat chronic disease and poor nutrition by ensuring that remote indigenous communities have access to healthy, safe and suitable quality food. There is little point in expecting people to eat healthy food that is unappealing. Would you rather eat a crisp lettuce or a limp one; a rotten apple or a fresh one? Healthy food must be “appealing” and taste good. The food must be regularly available and it must be affordable. If you have a fixed income of $200 per week for your family would you pay $9.00 per kg for fresh tomatoes? Probably not. the transport of the food from the source to the community. Impacting heavily on the issue of affordability is the cost of the food supply chain and its performance. This means the cost of the food supplies, freight transport and handling, storage and retailing. Figure 1 maps these relationships. 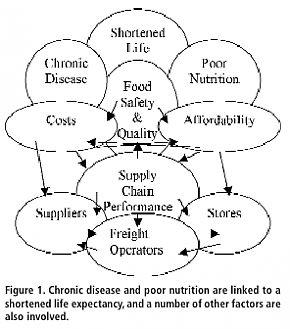 Figure 1 shows that chronic disease and poor nutrition are linked to a shortened life expectancy, and the relationship between these and other critical factors. It is important to note that the cost of food supplies, transport and store retailing affect the affordability of healthy food. Affordability also impacts on costs. Put simply, affordability and the cost of healthy food in remote indigenous communities are affected by volume. Small populations buy small volumes; if goods are expensive, people buy less. Supplier discounts are volume-based so the less you buy the more expensive it is. The smaller the volumes, the higher the retail cost and the cost of transport. Remote indigenous communities face greater freight challenges than those in highly populated areas because of accessibility, small freight volumes, limited choice of freight companies, higher costs, low buying power, an extended supply chain that makes it difficult to pinpoint the problem when something goes wrong, and feelings of disempowerment about freight issues. Of the healthy foods that need to be consumed to counter health problems in remote indigenous communities, more than 50% are perishable. There is therefore a real need for effective and affordable transport services to be available to all remote indigenous communities. For fruit and vegetables to be fresh and appealing the services need to be at least weekly and perishable products stored and carried under refrigeration. The Remote Indigenous Stores and Takeaway Transport Forum held in Adelaide in 2006 concluded that improvements to supply chain performance are needed to ensure that healthy nutritious food gets from supplier to store in top condition and to bring down costs. Following on from the forum, a Freight Improvement Toolkit (available at http://nrha. ruralhealth.org.au) was produced and a number of initiatives taken with communities in Western Australia, the Northern Territory and South Australia. These have in part been successful but a lot more needs to be done. Today, work with remote indigenous community supply chains shows that some are excellent, some average and others downright indifferent or worse. Members of the community, suppliers, store managers and even some freight companies seem to think in terms of freight being picked up, transported and delivered. They often don’t consider what happens before pick-up or after the goods have been delivered or how the cold chain or temperature of perishable goods is maintained. To address freight problems we need to look at the supply chain more closely from start to finish. Consider a supply chain for an apple from the orchards south of Perth to the top of the Dampier Peninsula. The journey involves 34 steps, 10 chain players and 23 cold chain breaks. In itself, each step in the chain is not rocket science, but someone failing to do the right thing can severely affect the quality and out-turn of the product. Looking at what sort of things sometimes go wrong in the fresh/frozen food supply chain can help to find solutions. Problems include late store orders, which leads to late supplies and late truck departures and deliveries. This contributes significantly to inadequate control of product temperature. Combined with that are products being packed and unloaded in the sun and trucks that are “temperature-compromised” because of the nature of their load. Poor temperature control can lead to unsafe food products, which not only are illegal but also can have a major impact on health, including food poisoning. The simple solution to temperature control is to have an unbroken cold chain with temperature-controlled loading facilities, specially configured trucks with separate freezer, chiller and dry freight compartments and refrigeration equipment suitable to meet the task. This can be readily achieved but it is costly and can significantly impact on the affordability of healthy nutritious food. So what can be done to manage the situation without putting costs through the roof? A good starting point is to map the temperature profile of the perishable goods to determine their temperature exposure over time. From there you can develop an action plan. For example, the supplier can bring the frozen meat temperature down to –30ºC and then cover the pallet with a thermal pallet cover and deliver the product to the transport depot. On receipt, the transport operator immediately places the pallet in the freezer/cool room. It is only brought out when all products are ready to consolidate on a store-by-store basis. Then the pallet is re-covered and placed in a pre-cooled truck. The pallet cover remains on throughout the journey to the delivery point. Not only does the cover help with temperature, it can also minimise cross-transfer of odours etc. All chain partners, from supplier to transport operator to store, need to use temperature probes and temperature dataloggers. Results can be readily downloaded and shared between all partners. Clinics in communities generally have this capability because they use it for vaccines and pharmaceuticals. Commitment: If suppliers, transport operators and stores are not interested and committed to the effective operation of their supply chain then nothing is likely to happen unless a catastrophe occurs. Too often this is the case. Cooperation: To address cost and affordability there needs to be high levels of cooperation between communities and stores along with transparency of process and group buying arrangements. Tensions often exists, particularly where parties need to work together, and cooperation is sometimes difficult if there is a vested interest or cultural constraints. Communication: Even the best-laid plans can go awry and that means that clear and open communication between supply chain players need to be effectively maintained at all times. This is assisted by scheduled regular reviews and maintenance of a freight/supply chain log. Capability: For the supply chain to operate effectively and efficiently, those involved must be capable and have sufficient knowledge of managing supply chain operations. Capacity: If you don’t have the capacity to handle the supply chain tasks because you are too busy with other issues then all other efforts will fail. It is evident that most remote indigenous community stores are both underskilled and under-resourced. Recent announcements have been made about improving the health and life expectancy of remote indigenous communities in Australia, including initiatives improving housing, infrastructure and stores. However, no mention has been made of improving supply chain performance for healthy nutritious foods or how it might be done. This certainly seems to be a role for the Australian government and its jurisdictions. capacity to spend enough time on improving supply chain operations and monitoring food temperatures. To ensure that on-ground capacity is available, the national office could retain regionally accessible freight facilitators to work with communities, stores, suppliers and transport operators to ensure that effective supply chains are in place. They would provide independent advice and facilitation as needed, and also focus on improving freight management skills in stores and communities. Part of their role would be to transfer these skills to indigenous people living in the remote areas. The facilitators could also act as troubleshooters and be honest brokers to help communities work through issues and increase the level of cooperation between communities. I encourage people to urge government to make available the necessary resources to help remote indigenous communities improve their food supply chains and establish national access to better freight skills and facilitation services. It really will make a difference to the health agenda and improve access to healthy nutritious food that is both appealing and more affordable. © Ian Lovell 2008. Reproduced with permission.